NEH (Notartzeinsatzhubschrauber) Robinson R44 Raven II D-HMIA of Ambulanz Millich-Rettungsdienst GmbH was seen at the helipad of the ambulance station of Ambulanz Millich in Kessin near Rostock, Germany, when in service as "Rettung 029-01-82-1". 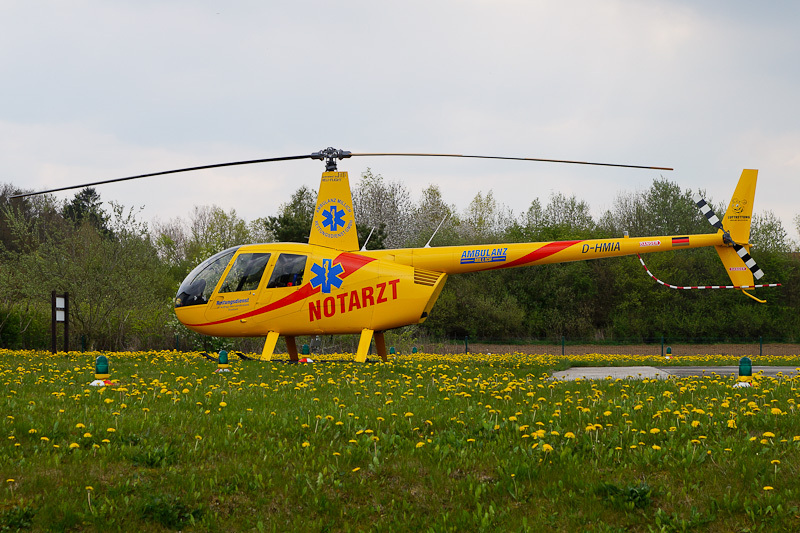 The 2014-built Robinson R44 Raven II c/n 13649 was registered D-HMIA in Germany on 3 April 2014 with Heli Flight GmbH and leased to Ambulanz Millich-Rettungsdienst, Kessin. The Robinson R44 Raven II D-HMIA replaced Robinson R44 Raven II D-HHRO in service as NEH with Ambulanz Millich-Rettungsdienst. The NEH started its operations in 1995 and was known as NEH Bad Doberan. The helicopter is not a rescue helicopter, but is exclusive used for the fast infeed of the emergency physician and a paramedic to the scene of the accident where to the ambulance is going. The NEH is operated in order of the district of Rostock in Mecklenburg-Vorpommern. The medical staff is supplied by Universitätsklinik Rostock.